2018 Gift Guide For Everyone on Your List! Here it is! This is the very first thing I did when I finished my finals at UCLA. 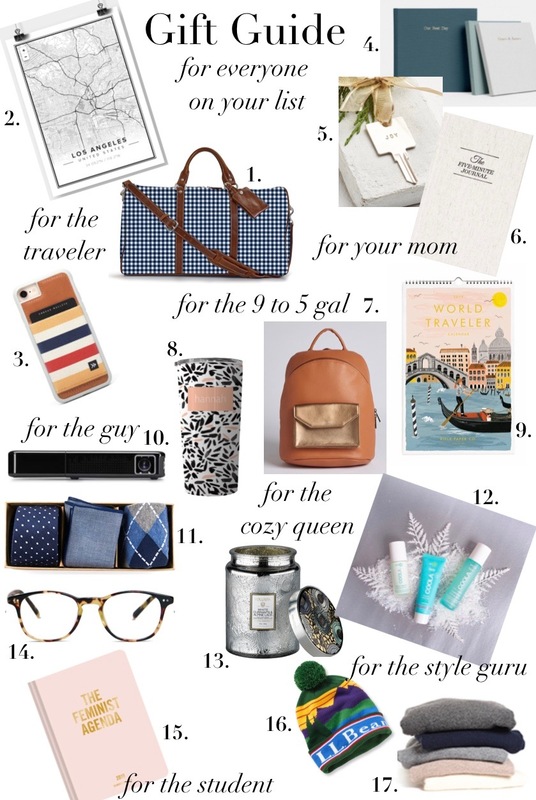 You guys really love the yearly gift guides I publish, so I couldn't stop the tradition. This year I've gotten so much joy in finding the perfect gift for each person on my list, so I broke this year's gift guide into categories that make it easier to find something for everyone! Hands down the best piece of luggage I've ever owned. It's just small enough to be a carry on, yet fits everything you need. I've taken just this bag with me to both Paris and NYC for week long trips without having to check a bag. I got a Mapiful print for Kyle with the location of where we got engaged. It is such a sentimental gift and I can't wait to have it hanging in our first home together. I am such a fan of phone case wallets-- especially when traveling. I have used one for years and actually don't carry a purse anymore. Artifact Uprising has the most high quality, beautiful paper goods. I got a photo book in the "sea mist" color and it is stunning. What better way to spread some joy this holiday than with such a beautiful reminder that does good for our communities at the same time. All of the Giving Keys products are hand stamped, assembled, and packaged by those transitioning out of homelessness. This daily journal is beautifully bound and based on psychology research to make your day more positive, intentional, and happy. As a commuter, the struggle of a stylish, durable bag is real. This is the perfect combination of functionality and style. May Designs is like Build-A-Bear for adults. There are hundreds of design combinations, so you can customize a mug to exactly match your style. Plus, since it's personalized, no one at the office will get coffee mugs confused again! I've had the World Traveler calendar for the past three years and it is such a fun addition to my workspace. Rifle Paper & Co's illustrations are so beautiful. And at the end of the year you can cut out the art and frame it to make prints you can have up all year long! This gift set includes everything a guy needs to feel extra snazzy. I love that the gift sets come pre coordinated so that your socks, tie, and handkerchief all match! I got this for Kyle last year. I think you know a gift is a hit when it gets used almost daily. All you need is a blank wall or white sheet to project onto, and youre good to go. We are even taking it camping with us next week to watch a movie under the stars! This gift set is perfect for the skin care lover. It includes Coola's Makeup Setting Spray, Dawn Patrol Primer, and Cucumber Face Moisturizer. Seriously one of my favorite scents of the season. Plus, the container is so cute that when the candle burns out, you can repurpose as a vase! Buying glasses with a blue light filter is so important, especially because we are on our computers more than ever before. These styles keep eyes safe + stylish! This might be my favorite pick of this holiday season. I love that the front cover reclaims a phrase that has historically been more negative. Plus, each month has quotes from feminist icons and the weekly calendars denote important days in feminist history. I love a good pom hat. The vintage details on this one and all of the different color options make it even better! This pink cashmere sweater is gorgeous and on the more affordable end. My Mott & Bow jeans are truly the best fitting and most flattering pair I've ever owned! Everyone needs a staple pair on jeans, and these have been mine for the past year or so.